Our Re-treat guarantee means if you have any problems in Tarpon Springs FL we will come back and treat inside or out at no charge. Guaranteed! Protect your home and family from pest infestations in Tarpon Springs FL. With over 41 years in business, Crenshaw Termite and Pest Control, Inc. knows how to eliminate your pest problems in Tarpon Springs FL. 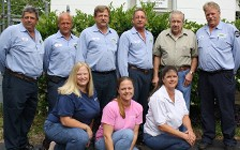 Crenshaw Termite & Pest Control Inc. uses the integrated pest management system. We inspect your property in Tarpon Springs FL, we identify your pest problem, and we develop a treatment program that fits your budget, your time, and eliminates your pest problem in Tarpon Springs FL. We Offer our Perimeter Plus treatment available Monthly, Bimonthly, & Annually Our Re-treat guarantee means if you have any problems in Tarpon Springs FL we will come back and treat inside or out at no charge. Guaranteed! Here at Crenshaw Termite & Pest Control, Inc. in Tarpon Springs FL, we have trained, professional experts in rodent control in Tarpon Springs FL, so let us removal those pesky mice and rats. Let our pest control services be the solution to one of the most destructive, dirty, and dangerous pests that you can have in or around your home or business in Tarpon Springs FL.